Choosing the best childcare with an outstanding preschool program for her son Jerry, was a priority Mona. That’s because Jerry, who started attending Oz Education Early Learning Centre when he was two years old, has a congenital heart defect. His mother Mona remembers that it was a very difficult decision and she wanted to choose the best childcare centre for her brave little boy. The past few years have also proved to be a tremendously fun learning journey for Jerry who struggled with learning due to his condition. 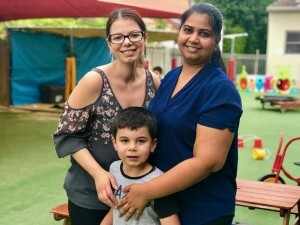 “Our play-based, tailored preschool program has helped Jerry build new skills based on his stage developmental needs and unique interests,” says Nishi Gupta, Centre Director at Oz Education. Mona is delighted to see the change now. Today, like most kids his age, Jerry loves playing soccer, eating pizza and spending time with his older brother and friends. Active and smart, no one would not have guessed that the brave little boy has a congenital heart defect. Jerry will start school at St Mel’s Catholic Primary School tomorrow.